and Jason Presson star in Explorers. In the 1980s, I was mesmerized by "boy movies" like Explorers, NeverEnding Story, Weird Science, ET and Stand By Me. Sure, it helped that the teen male actors were adorable, but the allure was deeper than that. It gave us girls a peek at the secret lives of boys. How they talked when we weren't around. How they thought. How they joked. What their bedrooms looked like ... everything! imaginative world of cute boys. 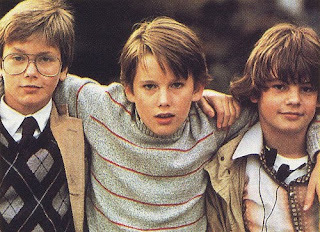 Basically Explorers focuses around three cute young teen boys portrayed by Ethan Hawke, River Phoenix (their first feature film) and somewhat unknown actor, Jason Presson. I thought Jason was extraordinarily special. His voice was noticeably deeper than the other stars. Slightly schlubby, he was cute without trying. His wavy hair didn't fall the way Ethan's and River's did and he seemed deep, dark and secretive. Sorry for getting slightly off-topic... Basically Ethan Hawke's character Ben has a vivid dream about traveling through space in a special space ship. He consults his friends and they get to work putting Ben's dream into action. 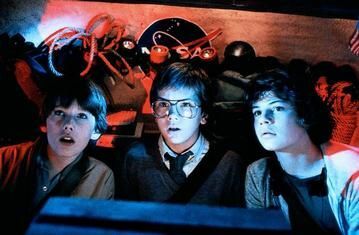 Explorers is obviously a fantasy film most youngsters would get excited about. You know, one of those movies you wish could really happen, but can't. Here are some bullet points about Explorers and a video clip of the Explorers trailer featuring Ethan, River and Jason. Explorers was written by Eric Luke and directed by Joe Dante. The DVD version of Explorers cut two scenes from the original theatrical version, but threw in an additional scene missing from the box office release. Writer Eric Luke appears in the film as one of the boy's teachers. Amanda Peterson also stars in the film as a pretty 12-year-old prior to her role as Cindy in Can't Buy Me Love. I enjoyed all the movies you mentioned as much as my boys did. I loved River Phoenix in Stand By Me. I have the soundtrack to the movie too. I'll have to check out Explorers, as I've never seen it. My friend and brother and I made a spaceship after we watched Explorers. We actually made it to space. All the neighborhood kids were amazed. It's a day that we'll never forget. Wow - I can't believe I've never seen that one! Stand By Me was just on TV the other day; I had to watch. I got to thinking of all the movies that River would have been in, if he lived. sigh. I Looove him in The Last Crusade - even if it's only for 15min. The late River Phoenix was in Indiana Jones and the last crusade. I've never seen or heard of this movie. I'll have to netflix it or something, thanks for the review! I've given you The Versatile Blogger Award! I remember watching this movie as a kid. Have never seen this movie. Must. See. Immediately. This was one of my favorite films back when I was a kid. The fact that they built their spacecraft out of a Tilt-A-Whirl ALONE made me love it! And remember the talking hamster??? "I...would...like...some...cheese..." Hilarious! Ethan Hawke is super cute as a kid! Romper Room Magic Mirror Never Saw Me!